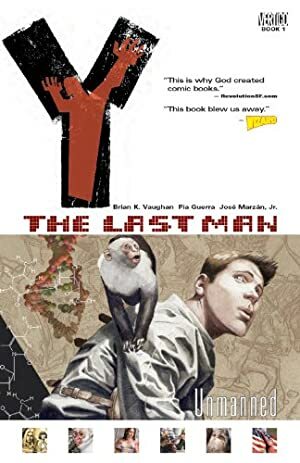 Written by Brian K. Vaughan (Lost, PRIDE OF BAGHDAD, EX MACHINA) and with art by Pia Guerra, this is the saga of Yorick Brown -- the only human survivor of a planet-wide plague that instantly kills every mammal possessing a Y chromosome. Accompanied by a mysterious government agent, a brilliant young geneticist and his pet monkey, Ampersand, Yorick travels the world in search of his lost love and the answer to why he's the last man on earth. Collecting issues #1-5. Track It. This book has been £3.79 within the past year. Log In to track Pia Guerra on eReaderIQ. to be notified each time the price drops on any book by Pia Guerra. to stop tracking Pia Guerra. We started tracking this book on April 5, 2013. This book was £7.12 when we started tracking it. The price of this book has changed 82 times in the past 2,205 days. The current price of this book is £7.12 last checked 4 hours ago. This lowest price this book has been offered at in the past year is £3.79. The lowest price to date was £3.32 last reached on December 19, 2017. This book has been £3.32 3 times since we started tracking it. The highest price to date was £7.49 last reached on November 6, 2015. This book has been £7.49 3 times since we started tracking it. We last verified the price of this book about 4 hours ago. At that time, the price was £7.12. This price is subject to change. The price displayed on the Amazon.co.uk website at the time of purchase is the price you will pay for this book. Please confirm the price before making any purchases.